Optimization is integral to digital performance and Amazon is clearly a leader in implementing optimization techniques that can have a great impact on retail websites. The much hyped and anticipated Amazon Prime Day, held between July 10 and 11, was yet another example of Amazon’s impressive hold on the e-commerce industry. The company surpassed its Black Friday and Cyber Monday sales during the 30 hours marathon sale. The sales performance managed to deliver better than expected and the event registered a 60% increase in growth this year. But how well did Amazon perform when it came to digital experience? Let’s look at the numbers and analyze how the Amazon website, both desktop and mobile, handled the influx of traffic. Amazon was well prepared to handle the load with millions of transactions going through without a hitch. There were no major outages or performance slow downs during the course of the sale, which speaks volumes to the preparation that has gone behind the scene. 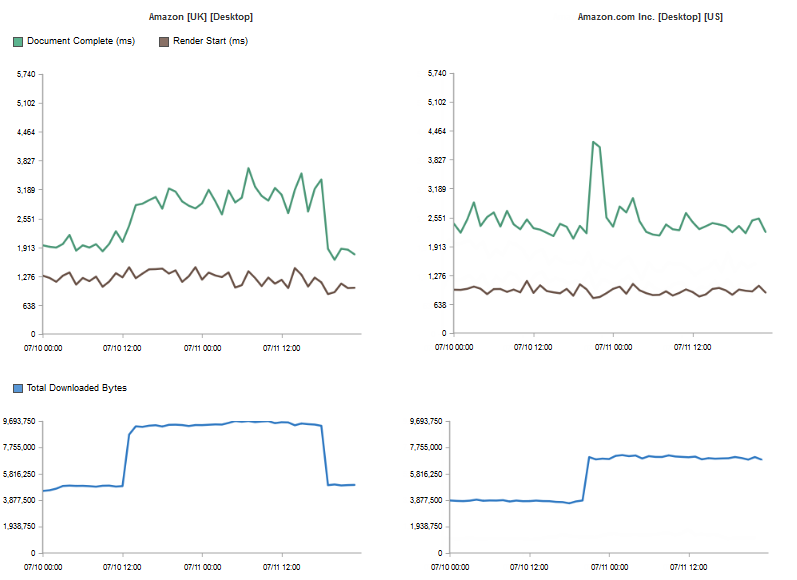 Based on the performance data collected we collected, the Amazon desktop site managed to deliver a page speed below 2.6 seconds, while the mobile site loaded in 1.7 seconds. The table below lists the different performance metrics to help gauge how well the website, US and global, performed on desktop and mobile devices. There was an increase in the page size as soon as the Prime Day deals went live. The sudden surge in traffic and the heavier page size slowed down the website. The load time for Amazon U.S. climbed up a few hours into the sale and stabilized as the day progressed. On the other hand, the Amazon U.K. site slowed during the sale and the site was faster when the sale ended on July 11. The additional bytes on the page were mainly from new images. The desktop sites saw a spike in the number of images on the page, but this spike was relatively smaller in the mobile version of the site. Website optimization is integral to digital performance and Amazon is clearly a leader in implementing optimization techniques that can have a great impact on retail websites.